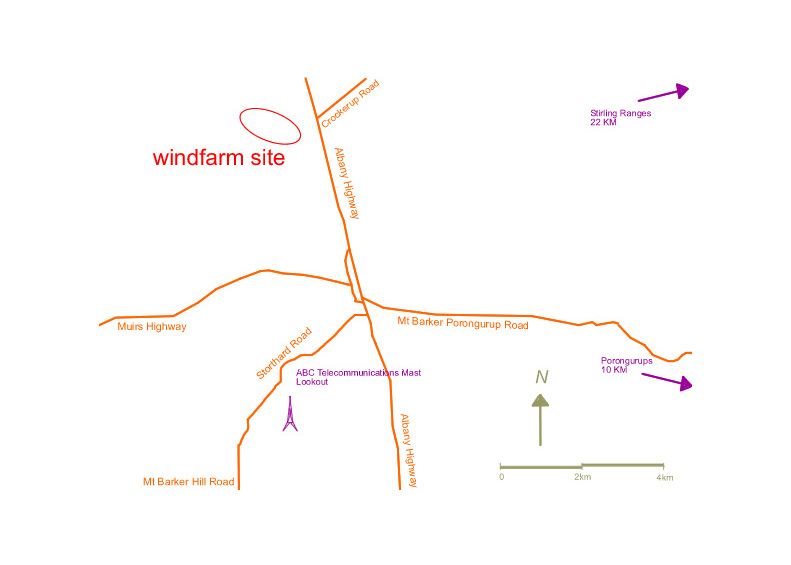 Below are three photomontages based on the windfarm located at site E, just over 3 kilometres north of Mt Barker on the western side of Albany Highway. NOTE: As neither turbine type nor micro siting had been finalised at the time the photos were taken, these images are only indicative. What the actual view of the turbines will look like also changes with the weather. During fog or low cloud, they may disappear completely. By stark contrast is the situation where bright sunlight shines on the hill when there are dark clouds in the background, this highlights the turbines. Most of the time, the view of the turbines will be between these two extremes. The layout is nominal only, the locations will change over time due to micro siting constraints and other considerations. These changes will have little impact for the two distant photos. It is unlikely the nearest turbine in the southern house image will come any closer/get any bigger, though it is possible the other two machines will come closer. These images have been produced by using a Olympus digital camera, C 4040Z and WindFarm V4.0 software.